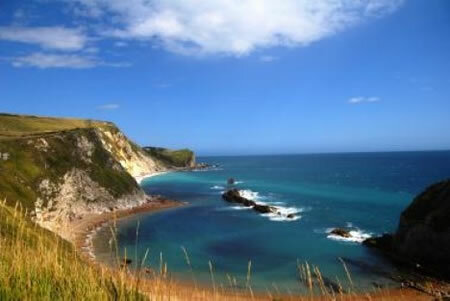 There are many reasons to take a caravan to the Jurassic Coast. A caravan holiday allows you to experience the outdoors and wake up each morning surrounded by glorious countryside, but without the exposure to the elements that comes with staying in a tent in the ever-unpredictable English weather. It’s your trusty family home from home, and there are few better places to bring it to than the stunning, unforgettable ancient coastline that spans Dorset and East Devon. Arriving at our Dorset caravan park, you pull up and park your caravan in a beautiful leafy valley surrounded by green hills, with the sea only moments away. You can then relax and take your time settling in, knowing that all the facilities you will need through your stay are close at hand, with a nearby laundry room, baby-changing facilities and under-floor heated toilets and showers. Water and electricity is all provided for you (16amp electric hook up), so what better way to toast your arrival in Dorset than by soaking up the scenery and sitting down to a nice warm cuppa while you plan how you’re going to spend your time in the county? The great thing about the Jurassic Coast is that you do things at your own pace here – there’s plenty of opportunity for relaxing as well as for adventure over the course of your stay.